In a medium-sized bowl whisk together lemon juice, and vanilla yogurt, set aside. Puree blackberries and mixed berry yogurt, set aside. 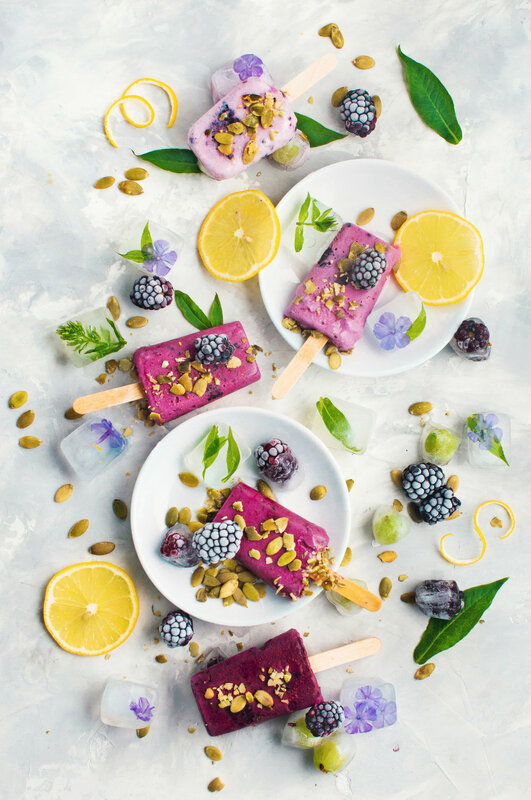 Layer the popsicles as follows; 1 tablespoon lemon, 1 tablespoon blackberry, repeat. Swirl layers if desired. Gently tap the molds on the countertop to remove any air bubbles. Insert the popsicle sticks, and then freeze for at least 6 hours, or overnight. 2. Orange Pink Lemonade popsicles – This flavor combination is suuuper simple. With your popsicle mold, you just need to add orange juice and let it freeze before you add the pink lemonade on top. Here’s the recipe for additional details. 3. Strawberry and Yogurt popsicles – Prep these berry and yogurt pops with your little ones! Give them the fun task of mashing up the strawberries and putting them into the molds. You can handle the task of pouring the yogurt inside and mixing the fruit around. Here is this yummy recipe so you can save it for future reference. 4. Watermelon Pineapple popsicles – Refreshing, tangy and fruity! This blend of watermelons and pineapple is a great option for kids. Plus, it’s a healthy snack option that won’t break the bank. Here’s the recipe!